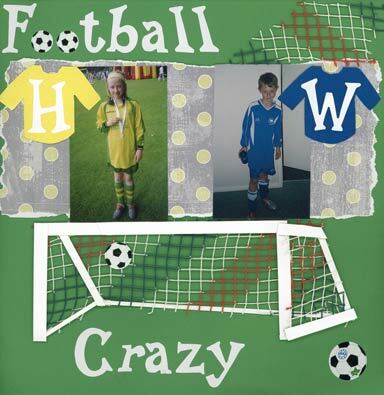 My soccer scrapbook layout celebrates my children's appetite for active sport and their love of 'the Beautiful Game' in particular. Your sports layouts will thrill your sporty descendants! However, for us, this game will always be 'FOOTBALL'! Hannah and William's kits gave me my colour scheme. I then found a great scrapbooking paper from Melissa Frances, which complemented the colours as well as introducing a 'ball' logo. I like to colour match and mood match at the same time where possible. Unlike many other layouts that need a subtle, understated journaling style, a soccer page layout is a good opportunity to TURN UP THE VOLUME! I used white Papermania cardstock with my 'Sissix Machine to get the impact I wanted. NEED MORE IDEAS? FIND THE NET! If you consider yourself a child of the 'digital age', there's a huge digital scrapbook supply, including page kits, free scrapbook layout ideas, and a host of embellishments and scrapbook papers to give your sport stash a real 'competitive edge'!